Hey now!! Welcome to Cosmic Dyes! If you don't see what you're looking for please e-mail us through the info section. We would be happy to make something for you! We are happy to bring you some of the brightest, tightest tie-dyes ever created. 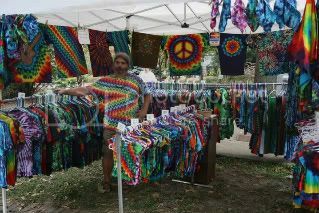 You may have seen us at craft shows, music fests,or possibly at some of the Dead/Furthur shows. We have been creating tie dyes for more than 23 years. All of our garments are hand dyed, on quality materials with Procion dyes. All are one of kind originals, no two are exactly alike. Please check back here regularly as we are constantly adding new inventory. We use high quality commercial Procion MX dyes on all of our clothing. We use a special chemical process to set the dye into the fabric. This ensures that the colors will be vibrant for years to come. All pieces go through 4 hot washes and 2 hot dries to remove all excess dye. We recommend washing your tie-dye in cold or warm water with like colored clothing and tumble dry on warm. We accept Paymentech, PayPal, Master Card, Visa, Diner's Club, money order or cashiers check.